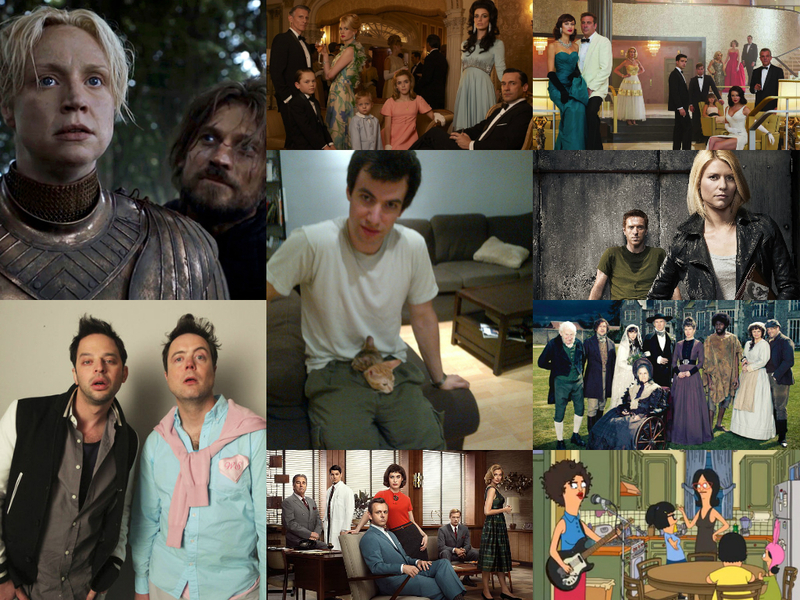 It is the end of the year and that means we are looking back at what we watched and loved in 2013 (in two parts). Kerri: The Wheels Ontario sketch on Kroll Show was a sketch tailor-made for me and, seemingly, only me as it hasn’t returned since its initial appearance. What I love about it, and all of the pop culture/TV related sketches on Kroll Show, is how accurate it is to the source material (and how much I love that source material). What I wouldn’t give to watch a whurling match live. Betty: You and Bobby had the same look on your face when she was playing. She’s a year older than Sally, shame on you. Henry: Betty what the hell? Betty: You said you wanted to spice things up, would it ruin it if I’m there? You know what if you want to be alone with her, I’ll put on my house coat and take Sally for a ride. You can stick a rag in her mouth and you won’t wake the boys. Katie: It’s Always Sunny in Philadelphia. Season 9 wasn’t a good year for the Sunny gang. The show is showing its age and it just didn’t live up to other seasons. Another big disappointment was Derek, but I have to say there were a few interesting bits in Derek. At least it gave me something to rant about for a week or so. Sunny just left me flat. Kerri: The cancellation of Magic City. Magic City was just at the point in its short life where everything was coalescing, moving forward, getting crazier and becoming a more deeply moving show about the strain of business on family. Starz seems to have a track record for cancelling shows after two seasons on the air (see also Party Down) and Magic City was no exception. Thankfully, Starz ordered season two before it knew how bad the ratings would be. Season one is a bit of a mess but season two goes for broke and is truly one of the more fun, unique and thrilling experiences I had watching TV this year. A mention must also be made about the cancellation of Enlightened, one of the best shows to grace the small screen this year. Claire Danes’ storylines on Homeland. The entire third season was built around Brody’s death which didn’t leave much for Danes to do independent of his character. The writers did let her pine a bunch for Brody in the psych ward, go off her meds so she could carry his love-child, help his daughter out of a jam, get herself shot trying to clear his name, get him back into fighting form so he could save the country (but really to try to clear his name again so they could raise his love child together), scream his name as he is being hung from a crane and deface government property so she could commemorate Brody via sharpie marker. It was disappointing to see such a talented actress (and well-developed character) forced into making uninteresting, reactive choices because of the material she was given. Graeme: Bob’s Burgers seems to feature a great song every episode. The original songs are so good, artists like The National and Stephin Merritt (of The Magnetic Fields) have been releasing covers around the air-dates of the show. Two of my favourites are “Bad Girls” Tina’s song about falling into the wrong crowd at school and “Electric Love” Gene’s song about Thomas Edison’s infamous (and completely true) electrocution of a live Elephant. Check out St. Vincent’s version of Tina’s “Bad Girls”. Ivan: Jimmy Fallon from Late Night with Jimmy Fallon. Lip-sync episode with Stephen Merchant and Joseph Gordon-Levitt. Fallon’s performance left me with an uneasy feeling towards 80s’s music. God Dam him.